I am almost finished one of my wrist cuffs. I ended up picking a rusty brown embroidery? 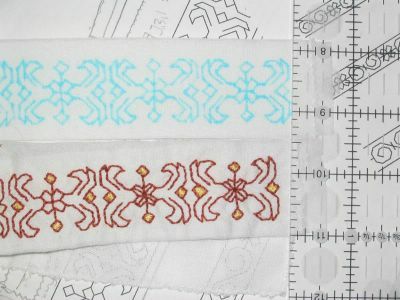 thread (I used 3 strands of the 6-strand stuff you usually use for cross-stitch). I cut a strip of iron-on interfacing for the cuff stability ( my camica fabric is really flimsy, and I think I needed more structure). The wrist bands are 1.5 inches wide. 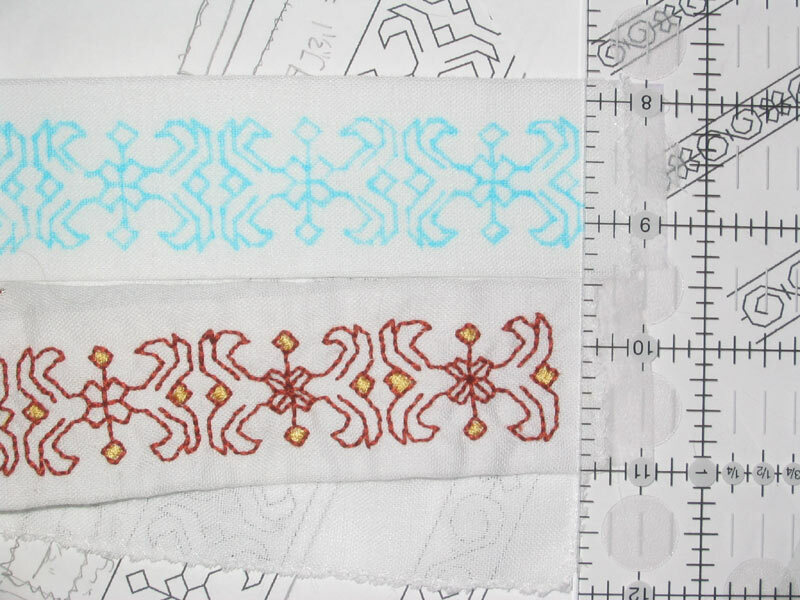 I drew the blackwork design on them with wash off fabric marker. Luckily, 1 layer of camica fabric and 1 of interfacing were fairly transparent, so this was simply a matter of tracing. Here's my progress so far. Its most certainly got that hand done look. But thats the point, right? As you can see, I decided to get "fancy". I filled in the diamonds with some yellow thread I had in my bag which happens to be the same yellow thread I used to do the edging on my camica neckline and sleeve bottoms. Why? Mostly cuz I only brought one wrist cuff for the weekend and I finished it more quickly than expected and wanted more busy work. I also thought the yellow would tie in with the edging and look nice. Period? I dunno. But I like it.